I also used to move around a lot, so I’ve pounded the pavements of my hometown, Belfast; navigated the sidewalks of Manhattan; jogged on the banks of the Danube in Budapest; run through the Tokyo night in summer, when the heat and humidity is just about bearable, dodging cicadas as they dropped from the scattering of trees; and sweated through circuits of my local park where I now live in England. There’s a house in that park straight out of a child’s bad dream. Top-heavy with a massive, towering chimney and dark, grime encrusted windows, it squats on the perimeter of the grass in front of a regimented line of neat terraced houses’ back yards like a brick witches’ cottage from a Grimm fairytale. I passed that house every time I ran through the park and, eventually, wrote a short story about it. A weird crime-horror hybrid about a Belfast paramilitary-turned-informant haunted by his past, I sent it to One Eye Press after spotting their Blight Digest Fall 2014 and was surprised and honoured to have it accepted for the Winter 2015 edition. There it was, my story, “Running On Dead Leaves,” in print. It was a massive encouragement in terms of sitting my arse on a chair and putting words down. That was before October 2014, when my beautiful daughter was born and I had other, more pressing things to do – like down a couple of beers and have a bit of craic with friends in the rare quiet moments. One of those mates, over several of those beers, made a bet with me shortly after my wife and I knew a wee package was on the way. He bet that I couldn’t write a novel before my daughter arrived. Red rag to a bull, I went for it. 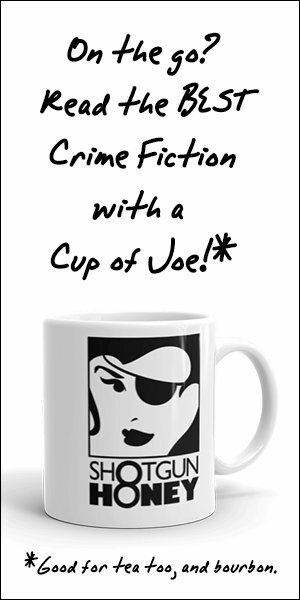 I thought back to writing my crime-horror hybrid and realised I enjoyed the paramilitary crime angle more than the horror, so I set to work. Belfast has changed a lot since I left home, and the republican and loyalist ceasefires of 1997/98. For a start, it was the safest city in Europe in terms of conventional crime during the ‘Troubles’ while the balaclava set were busy scurrying around blowing half the country to bits, shattering teenagers’ kneecaps and shooting various folk in their beds. Now, according to some indexes, it’s the third most dangerous city in the UK behind London and Glasgow, and ranks up there with Dublin and Limerick if you’re talking Ireland-wide. What if a character who’d been in the thick of it back in the bad old days came back after a long time away? What if his old comrades were drug dealers and gangland kingpins? What if the past was still very much alive? Belfast, 1993: Jackie Shaw is a young tearaway running with paramilitaries in Belfast. He treads a fine line keeping psychotic hard-man Rab Simpson in check while sleeping with gang leader Billy Tyrie’s beautiful wife on the side. Twenty years later, Jackie returns to the city for his father’s funeral after disappearing in mysterious circumstances. He wants to mourn then leave, but when figures from his past emerge, he is left with no choice but to revisit his violent former life. Give it a try. It’s a brick-hard crime novel with a couple of twists and a glimpse of the stark reality behind the headlines from Northern Ireland. And thank you One Eye Press, for giving me a leg-up with that first published story in Blight Digest. Now, I might just go for a run tomorrow. After I finish off the beers in my fridge tonight. John Steele was born and raised in Belfast, Northern Ireland. 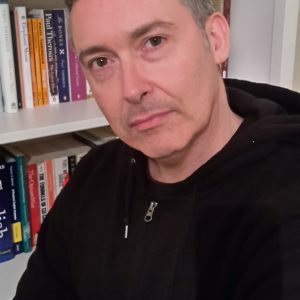 In 1995, at the age of twenty-two he travelled to the United States and has since lived and worked on three continents, including a thirteen-year spell in Japan. Among past jobs he has been a drummer in a rock band, an illustrator, a truck driver and a teacher of English. He now lives in England with his wife and daughter. 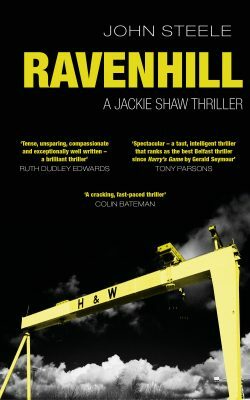 Ravenhill is his first novel and a second Jackie Shaw book, Seven Skins, has already been signed by Silvertail Books for publication. He is currently writing a third, set in northern Japan.